In Japan, dogfights are family outings. Outside the arena, people cook yakitori skewers over makeshift grills, and kids eat watermelon and bento. Inside, rows of folding tables are set up for the crowd. They smoke, fan themselves and drink green tea from little plastic cups. The temperature is pushing 100 degrees, and some men’s tattoos are visible through their thin cotton shirts. No permits or licenses are required to fight dogs, so there’s no official record of how many fights happen each year. 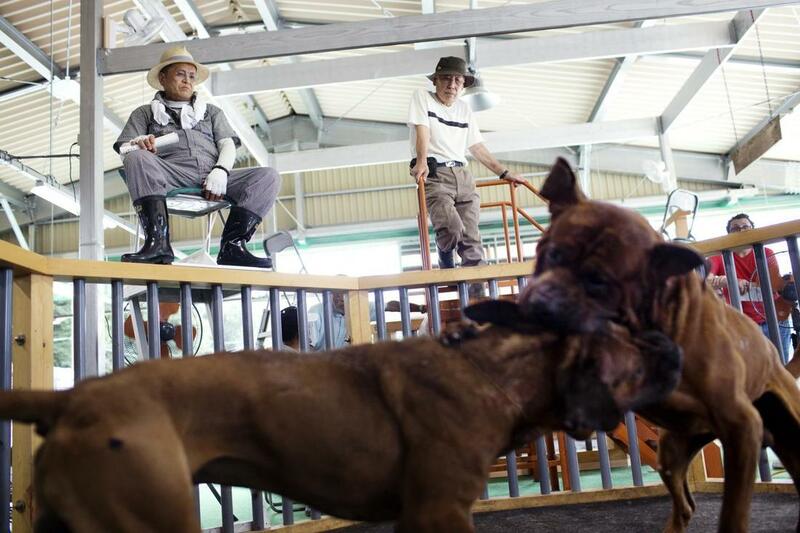 Teruaki Sudo, president of the East Japan Dog Fighting Association (and Hiroshi’s father), says his group holds eight or nine tournaments per year, while smaller groups might hold two or three. Between 60 and 100 dogs might fight in a small tournament. In a large tournament, that number could be as high as 250. It’s impossible to say how many fights happen off the books each year, especially if you count pit bull fights, which are almost entirely sponsored by the Japanese mafia, or yakuza. Only five of the country’s 47 prefectures have laws against dogfighting. Tokyo is one of them, so Tokyoites like Sudo come to the sticks, to places like Bando, a smallish farming town two hours northeast of the capital, to fight. Dogfights are loud, Sudo explains, “so it should be in a place where almost no one lives. Sumo (相撲 sumō) or sumo wrestling is a competitive full-contact wrestling sport where a rikishi (wrestler) attempts to force another wrestler out of a circular ring (dohyō) or into touching the ground with anything other than the soles of his feet. The characters 相撲 literally mean "striking one another". The sport originated in Japan, the only country where it is practiced professionally. It is generally considered a gendai budō (a modern Japanese martial art), but this definition is misleading, as the sport has a history spanning many centuries. Many ancient traditions have been preserved in sumo, and even today the sport includes many ritual elements, such as the use of salt purification, from Shinto. 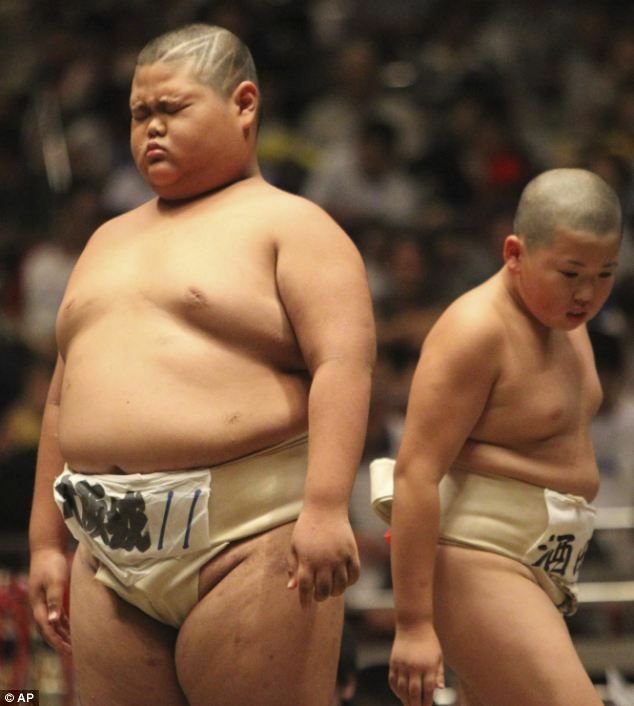 Life as a wrestler is highly regimented, with rules regulated by the Japan Sumo Association. Most sumo wrestlers are required to live in communal sumo training stables, known in Japanese as heya, where all aspects of their daily lives—from meals to their manner of dress—are dictated by strict tradition. Due to the hierarchical structure of the sport, where top ranked wrestlers have great advantages in salary and status over lower ranked wrestlers, speculation about the existence of match-fixing and isolated reports of match fixing have surfaced over the years. 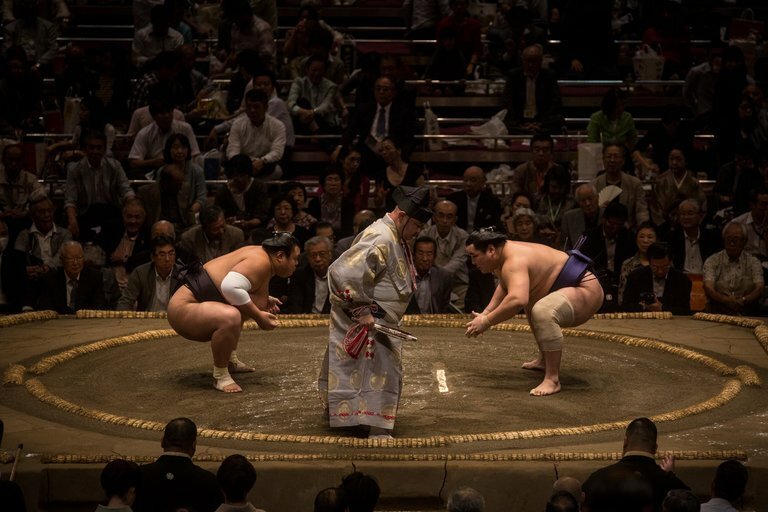 The Japan Sumo Association (JSA) repeatedly denied any wrestlers were involved in match-fixing, known as yaocho, and even took publishers to court over such allegations. However, in 2011, it was announced that an investigation by police had discovered cell phone text messages indicating that a number of matches had been fixed. Allegedly, 14 wrestlers and a few stablemasters were involved. In the course of the investigation, several wrestlers eventually admitted to match-fixing for money. As a consequence, the board of directors of the JSA decided in an extraordinary meeting to cancel the March 2011 tournament in Osaka, the first time this had happened since 1946. In all, fourteen wrestlers were judged guilty of match-fixing, to which most of them admitted involvement. All of the wrestlers judged to be involved were forced to retire. The JSA's investigative panel stated in May 2011 that match-fixing appears to have been widespread. The panel stated that it would be difficult to discover, however, the full extent of the problem. The May 2011 tournament went ahead but with no sponsorship, live TV coverage or trophy presentations, and was referred to as the "Technical Examination Tournament." Professional sumo is notable for its exclusion of women from competition and ceremonies. Women are not allowed to enter or touch the sumo wrestling ring (dohyō), as this is traditionally seen to be a violation of the purity of the dohyō. The female Governor of Osaka from 2000–2008, Fusae Ohta, when called upon to present the Governor's Prize to the champion of the annual Osaka tournament, was required to do so on the walkway beside the ring or send a male representative in her place. She repeatedly challenged the JSA's policy by requesting to be allowed to fulfill her traditional role as Governor. Her requests were repeatedly rejected until the end of her five year term. In April 2018, during a non-tournament sumo event in Kyoto Prefecture, two women rushed to the aid of the mayor of Maizuru when he collapsed in the middle of the dohyō. As the women were attempting to provide emergency treatment, a referee repeatedly asked them to leave the ring. The chairman of the Sumo Association later apologized for what he called an inappropriate response, saying that he greatly appreciated the women's efforts. The view of those who criticize this continuing "men-only" policy is that it is discriminatory and oppressive. In general, women in the sumo world are only expected to be supportive wives of the wrestlers, and, in the case that their husband has become a stablemaster, a surrogate mother for all of his trainee wrestlers. The view of the JSA is that this is a tradition that has been firmly maintained through the centuries, so it would be a dishonor to all of their ancestors to change it. Sumo wrestlers purify the ring when they enter by tossing salt up in the air. Some wrestlers are particularly good at making a show of this by tossing the salt dramatically towards the ceiling. This tradition is related to a ritual known as Harae that's used to purify Shinto Shrines. Although it's often translated "purification", Harae is really an exorcism that's believed to drive out bad spirits. In Japanese, it is called chanoyu (茶の湯) or sadō, chadō (茶道), while the manner in which it is performed, or the art of its performance, is called (o)temae ([お]手前; [お]点前). 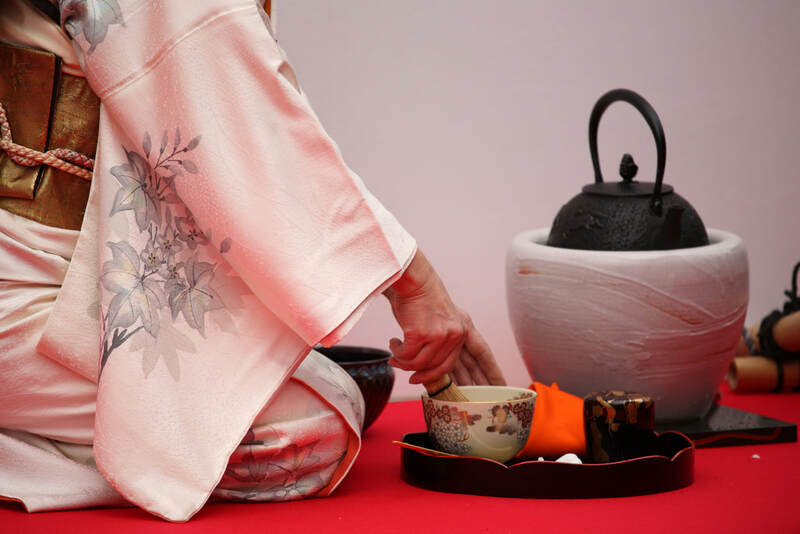 Zen Buddhism was a primary influence in the development of the Japanese tea ceremony. 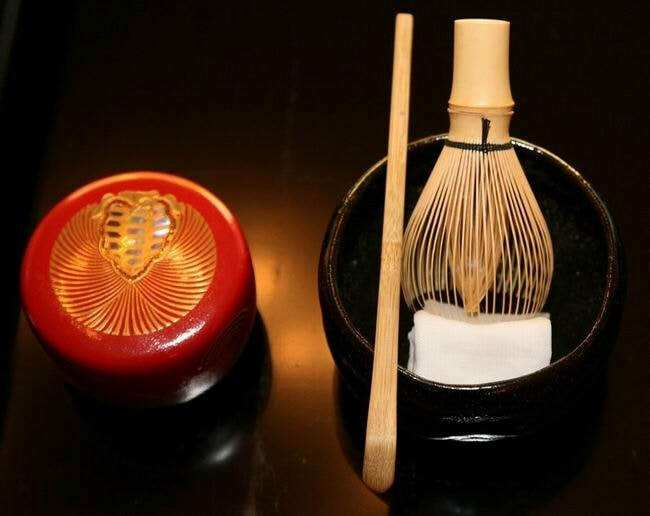 Much less commonly, Japanese tea practice uses leaf tea, primarily sencha, in which case it is known in Japanese as senchadō (煎茶道, the way of sencha) as opposed to chanoyu or chadō. Japanese gardens are traditional gardens whose designs are accompanied by Japanese aesthetic and philosophical ideas, avoid artificial ornamentation, and highlight the natural landscape. Plants and worn, aged materials are generally used by Japanese garden designers to suggest an ancient and faraway natural landscape, and to express the fragility of existence as well as time's unstoppable advance. Ancient Japanese art inspired past garden designers. By the Edo period, the Japanese garden had its own distinct appearance. Japanese gardens first appeared on the island of Honshu, the large central island of Japan. Their aesthetic was influenced by the distinct characteristics of the Honshu landscape: rugged volcanic peaks, narrow valleys, mountain streams with waterfalls and cascades, lakes, and beaches of small stones. They were also influenced by the rich variety of flowers and different species of trees, particularly evergreen trees, on the islands, and by the four distinct seasons in Japan, including hot, wet summers and snowy winters. Geisha, geiko, or geigi are traditional Japanese female entertainers who act as hostesses. Their wide skills include performing various arts such as Japanese classical music and traditional dance, witty games and conversation, traditionally to entertain male customers, but also female customers today. In modern Japan, geisha and their apprentices are now a rare sight outside hanamachi or chayagai (茶屋街, literally "tea house district", often referred to as "entertainment district"). In the 1920s, there were over 80,000 geisha in Japan, but today, there are far fewer. 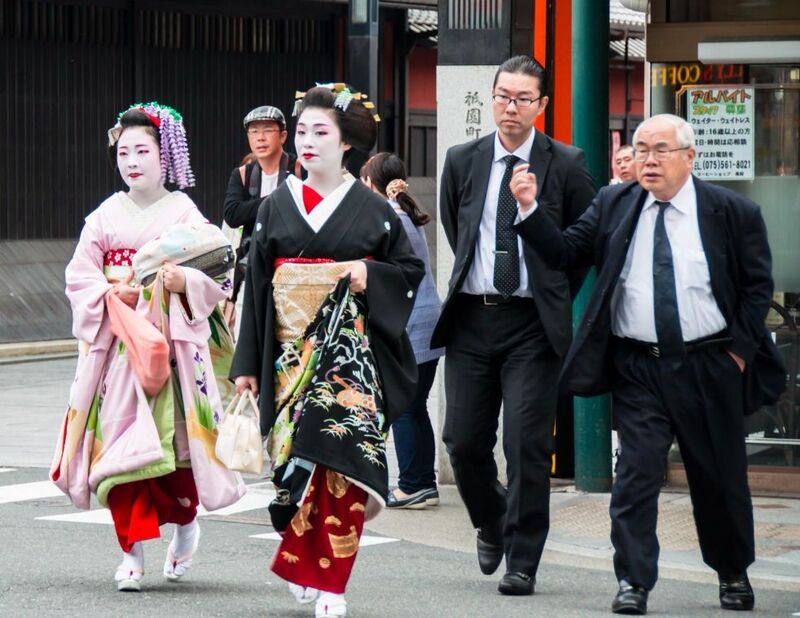 Most common are sightings of tourists who pay a fee to be dressed up as a maiko. A sluggish economy, declining interest in the traditional arts, the exclusive nature of the flower and willow world, and the expense of being entertained by geisha have all contributed to the tradition's decline. However, the flower and willow world has seen a resurgence in new members over the last 10 years due to the accessibility that the internet has provided for young girls wanting to know more about the profession and not needing a formal introduction to an okiya Geisha are often hired to attend parties and gatherings, traditionally at ochaya (お茶屋, literally "tea houses") or at traditional Japanese restaurants (ryōtei).